All transactions are safe and secure with a reliable history in online purchasing behind each of our associates. 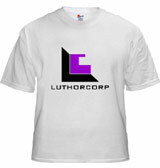 Buy the Luthorcorp Lex Luthor t-shirt to own Superman clothing and merchandise. Lex Luthor is the best known Superman villain. Now you can show you're a fan of this scheming entrepreneur / villain with the Luthorcorp Lex Luthor shirt shown at left. The front reads Luthorcorp in black lettering with the company's symbol positioned above. Inspired by Michael Rosenbaum's character's company on the Smallville television show, this tee will bring out your own inner Lex. In addition to the Luthorcorp Lex Luthor tee above, browse the Superman Clothing Gallery for more apparel like men's and women's clothes, kids shirts or hoodies.